"Still, about a third of families do not even apply for scholarships, showing that there is still significant opportunity for families to continue to defray the cost of college." NEWARK, Del.--(BUSINESS WIRE)--Family income and savings covered nearly half (47 percent) of all college expenses last year, according to “How America Pays for College 2018,” the national study from Sallie Mae — the nation’s saving, planning, and paying for college company — and Ipsos, an independent global market research company. 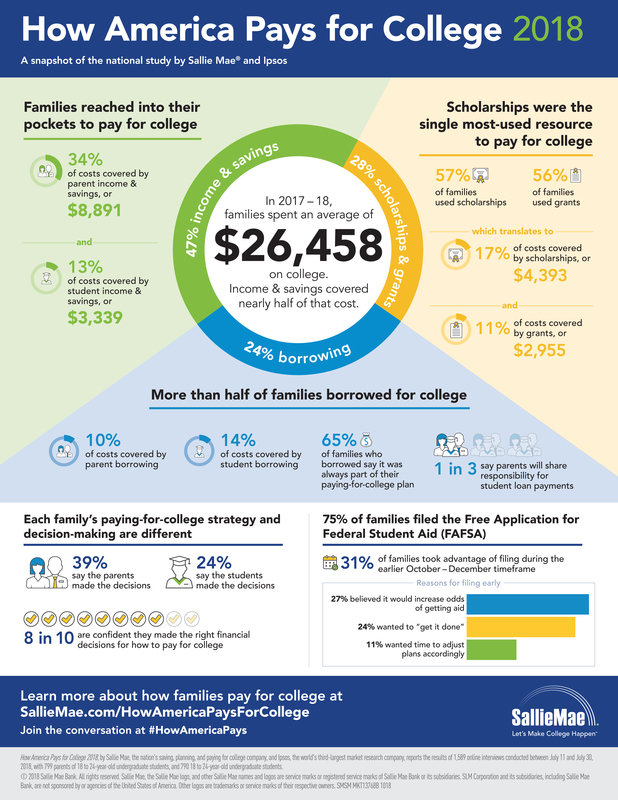 The annual research report examines how families pay for college, how much they spent, and how they made their funding decisions. The average amount spent on college in 2017-18 was $26,458. Three quarters of college funds came from sources other than student loans. Nearly half of college costs, 47 percent, were paid out of pocket with parents’ and students’ income and savings. Scholarships and grants paid 28 percent of college costs, and loans covered 24 percent of college costs. Extended family and friends paid an additional 2 percent of college costs. 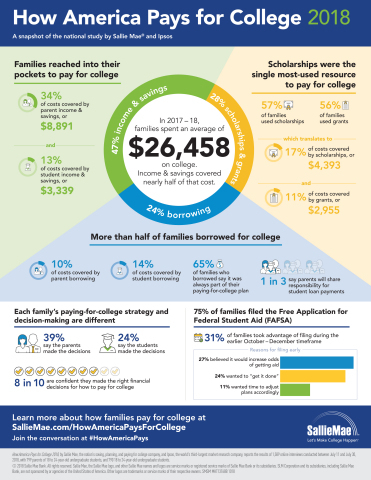 While no single resource is used by all families to pay for college, the most prevalent funding sources – scholarships, grants, and parent income – are each used by about three in five families. Scholarships are the single most-used resource to pay for an undergraduate’s education expenses, with 57 percent of families using them last year to pay some portion of the college bill. About three in five college students received one or more scholarships, with a total average amount of $7,760. More than half of families, 53 percent, borrowed money to help pay for college last year. Two-thirds of families who borrowed money last year said they had always planned to borrow to pay for college. When it comes to planning to repay loans, however, four in ten families, 39 percent, say they haven’t researched any repayment topics. Nearly two-thirds of families, 63 percent, expect the student will be solely responsible for paying his/her student loans. The majority of students, 57 percent, said they would prefer to make larger payments over a shorter period of time rather than stretch out payments to make the monthly payment more affordable. 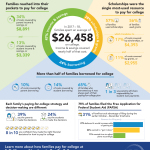 “How America Pays for College 2018” reports the results of 1,589 online interviews Ipsos conducted in July 2018 of 799 parents of undergraduate students and 790 undergraduate students between the ages of 18 and 24. Data and years shown reflect academic years (July 1 to June 30).